The evolution of the Madame Tussaud myth is illuminated by this little story concerning the corpse of Louis XV's mistress Madame du Barry, recounted by the historian Hector Fleischmann early in the 20th century. "The following mournful incident took place on 7th Frimaire, Year II (7th December, 1793). The dull shades of twilight were already enveloping the cemetery of the Madeleine, otherwise known as the Ville-l'Eveque, in which rested so many victims of the Revolutionary Tribunal. A man was waiting at the side of a freshly dug grave and, to protect himself from the keen, boisterous night-wind, had raised the collar of his bottle-green cloak and shiveringly wrapped himself in its broad folds. After a few moments he seemed to hearken, to watch for the heavy sound of a waggon in the distance. The noise grew louder, came nearer. At the further end, towards the cemetery entrance, the hinges of the carriage-gate were heard to creak and the cart, whose arrival the man apparently expected, shaking on the ice-bound earth, reached the grave by the grand avenue. Big red drops were trickling through the straw. Whilst the horse was still panting three men dragged out of the straw a heavy thing that gave a dull sound as it touched the ground. One of them then took hold of a smaller object and presented it to the waiting man. It was a decapitated head in which blood was clotted in wavy locks of hair, light-coloured and curly as a child's. The man took the head, doubtless with some feeling of repulsion which he soon mastered ; for was it not for that purpose that he had waited at this ill-omened hour in the silent cemetery ? And he set about his task. He took from under his cloak a piece of soft wax, some oil, a pair of pincers. Falling on his knees beside the decapitated head which he had set on soil drawn from the grave, he modelled it, restoring with an adroit, expert movement of the thumb the features which had been rather put out of shape, parting the hair from a forehead which was still pure despite wrinkles, hair which the sweat of the agony had glued to it. Thanks to his labour, Curtius, the founder and director of the museum of wax heads at the Palais Egalite, formerly Royal, was enabled to exhibit in his cabinet the authentic likeness of Jeanne Gomart de Vaubernier, Countess Dubarry. It was her truncated corpse which Sanson's cart had just deposited in the cemetery of the Girondins. At eleven the previous night the Revolutionary Tribunal had condemned to death the former courtesan, that sad, unhappy woman whom President Dumas had blamed for " the dissoluteness of her morals, the glaring publicity of her debauches. " The royal mistress had expiated on the Revolution scaffold the happy fortunes of past years, the queenship of her beauty and her confidence in an innocence which history has not taken the trouble to prove. 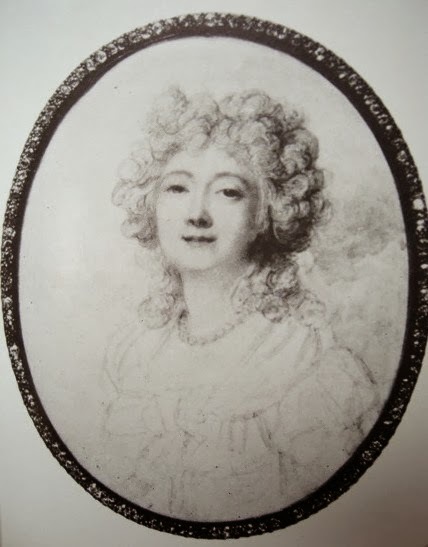 She was buried two paces away from Louis XVI's grave, and Mme. Roland and Charlotte Corday were already sleeping their endless sleep in the same plot of ground. And nothing remained of the Dubarry but the moulded waxen head in a museum where Jean-Paul Marat's wax bust was receiving the public homage of a posthumous, fleeting triumph." 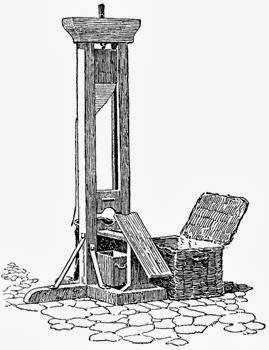 ...... At this point in 1793 the myth of moulds cast at the foot of the guillotine had clearly not yet reached its final form, though Madame Tussaud herself later used the notion of a furtive trip to the Madeleine, this time in her account of the search for the discarded remains of Marie Antoinette. Madame du Barry, of course, had in all probability already featured in the waxworks, boulevard du Temple, possibly as "Sleeping Beauty". Her louche past as royal mistress, coupled with her undignified hysteria in the face of Lamourette, guaranteed her star status among Curtius's exhibits. Hector Fleischmann, Behind the scenes in the Terror (English version 1914) p.310. The story continues to be embellished. See: David Jays, "Death doesn’t lie" obit-magazine 2009. We are assured that Curtius, known for the perfection with which he models in coloured wax, obtained permission to conserve by this process the features of Mme Du Barry and that it was in the cemetery of La Madeleine itself that he carried out this project. I don't think however that the portrait can be a very good likeness; the contraction of muscles in surprise or rage changes the features entirely; so much more so the convulsions of death.....But it for all that precious, due to the celebrity of she who is represented, even imperfectly. You can see this head, very well modelled, at the widow Curtius's, on the boulevard du Temple, in her cabinet. Mémoires historiques de Jeanne Gomart de Vaubernier, comtesse Du Barry, dernière maîtresse de Louis XV..... Paris, 1803. Written by Mme Guénard. (Cited Fleischmann, p.617). This looks like the same pamphlet mentioned by Kate Berridge and ascribed to "De Favrolles". Andrea Daninos, Une Révolution en cire (2016), p.39, gives the text of the relevant reference from Palloy's Livre de raison. It would seem that the two men, although outwardly cordial, were not "friends" at all; Palloy had cast aspersions on Curtius for his late arrival at the Bastille on 14th July. He now doubts the reality of his claims concerning the figure of Madame du Barry. In the afternoon I paid a visit to Citizen Curtius who welcomed me and showed me the head of Dubarry that he had just finished. Faced with my astonishment at the likeness, he recounted to me his method of copying from nature and how, on 17 frumaire (7th December last) he had waited in the Cemetery of the Girondins for Sanson's cart to bring her freshly severed head. In spite of the cold, he had installed himself, with his wax and brushes on the side of the burial ditch; he had anchored the head between two stones and then gone about reproducing the features. In reality, the resemblance was so great that he must already have moulded a wax mask from life, as he has done, I know, in the case of several others. Livre de raison, ed. 1956, p.212.